The National Garden Bureau decided last December that 2018 would be the Year of the Coreopsis. And I say yes, National Garden Bureau, yaasss! 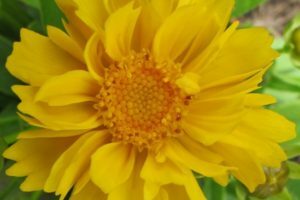 Coreopsis, common name Tickseed, has 38 naturalized species in the United States and is the state flower for both Florida and Mississippi. Centuries before we thought this flower looked great in our gardens, the native flowers were used to create dyes. They were also boiled down into teas by Native Americans before coffee was introduced. Botanists chose to name Coreopsis after the seed instead of the happy flower because – well, why not? The name is derived from the Greek words ‘koris’, meaning bed-bug, and ‘opsis’, meaning view. So basically, Coreopsis means the seed looks like a bed-bug. Luckily for us, Coreopsis also means ‘always cheerful’ in the language of flowers. I think we can just stick with that meaning, right? Bed-bugs certainly don’t bring cheerful thoughts or happy flowers to mind. 1) Moonbeam Coreopsis & Zagreb Coreopsis: These two Coreopsis are being lumped together because they are essentially oldies but goodes and if you have Coreopsis in your garden already – it’s probably one of these. 2) Cruzin’ Broad Street Coreopsis: Crimson red flowers with orange-gold tips cover the compact, thread-leaf foliage from late spring until frost. Deer and rabbit may leave this Coreopsis alone, but it will be frequented by bees and butterflies. 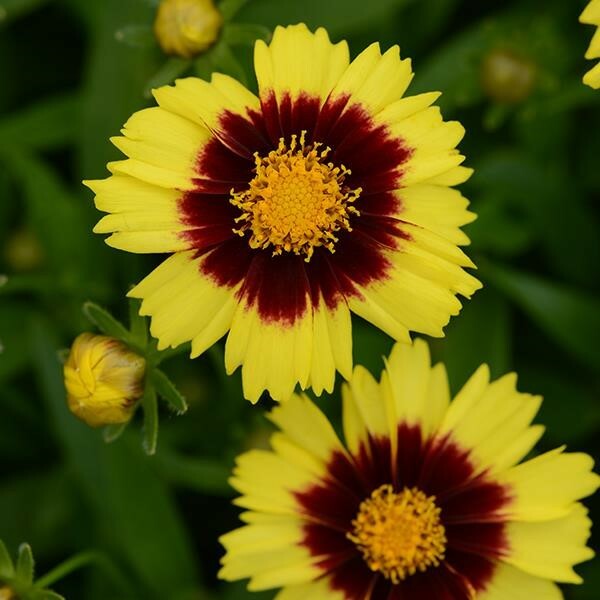 3) Mercury Rising Big Bang™ Coreopsis: Who doesn’t love these velvety wine-red blooms with their bright yellow centers? This variety of Coreopsis may be on the deer-resistant list but is loved by pollinators and butterflies. The soft and narrow foliage is mildew-resistant. 4) Lil’ Bang™ Daybreak Coreopsis: Red flowers with yellow tips and golden centers stand up above this compact plant. Daybreak will bloom throughout the summer if the spent blooms are removed. 5) Lil’ Bang™ Red Elf Coreopsis: Satiny red blooms with golden centers absolutely cover this compact plant from summer to fall. The small stature of Lil’ Bang™ Red Elf makes it the perfect perennial for small gardens or containers. 6) Uptick™ Red & Yellow Coreopsis: Impressive 3″ yellow flowers with a dark red eye bloom on this compact plant from May until September. 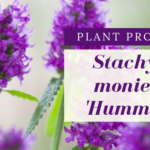 This drought-tolerant perennial is pollinator friendly and adored by butterflies. 7) Presto Coreopsis: Ruffled yellow blooms measure 2 to 2 1/2 inches in size and cover this dwarf plant. Butterflies and bees are attracted to this petite ray of sunshine. When the spent blooms are removed, Presto Coreopsis will bloom from summer through fall.